Gather round neoclassic fans! What we have here is a Tiffany. It was built by Classic Motor Carriages Inc. of Opa-Locka, Florida. This company is best remembered (if at all) as the manufacturer of the Gazelle neoclassic/Mercedes SSK replica. The Tiffany, with its Zimmer Golden Spirit looks, was probably the nicest car they built. The Tiffany is based on then-modern Mercury mechanicals. It’s powered by a 4.9-liter Ford V-8 and has such amenities as a power sunroof, power steering and a nice 1980s sound system. And, oh yeah, as is required in a neoclassic: it has a musical horn. These are perfect cars if you like to drive in parades and/or are a budding fashion designer with a penchant for stealing Dalmatian puppies. CMC got hit with a big lawsuit in 1994 and they are sort of still in business under another name, but their days in the turn-key neoclassic business are long behind them. 1989 was the final year for the Tiffany and this one will sell at no reserve. Click here for more info and here for the rest of Barrett-Jackson’s auction lineup. 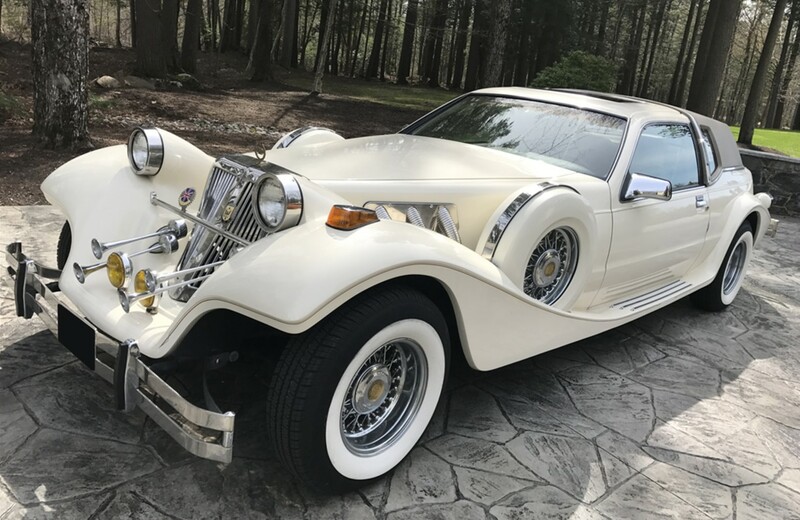 This entry was posted in Uncategorized and tagged 1989, auctions, barrett-jackson, cars, classic cars, coupe, neoclassic, tiffany by classiccarweekly. Bookmark the permalink.